Ben Patterson is a full service piano technician and has served the southern New Jersey piano market since 2010, providing piano tunings, repairs, regulation, maintenance, service and upgrades at a high quality and reasonable price. He is a Registered Piano Technician (RPT) with the Piano Technicians Guild, and a certified installer of Dampp-Chaser Piano Lifesaver systems. South Jersey Piano Service is a licensed and insured New Jersey LLC. Ben has played piano since the age of 5, and has had a fascination with mechanics for almost as long. His first formal job working on pianos began in university practice rooms during his undergraduate degree, working at minimum wage but learning valuable skills for the trade. Since graduating in 2009 with a Bachelor’s degree in Music Education, Ben has tuned and serviced pianos regularly and his client base continues to grow. He moved to New Jersey in the fall of 2009, was married in 2010, and now lives with his wife and daughter near Woodstown, NJ. South Jersey Piano Service grew out of the need he saw for quality piano work in rural South Jersey, and has been blessed with regular referrals from satisfied customers. Ben now travels across the entire southern half of New Jersey, servicing pianos in homes, schools, churches, studios, and numerous other institutions. When not working on pianos, Ben also teaches piano, performs professionally, directs the choir at his church, and serves as Director of Auditions and Solo Events for the Philadelphia International Music Festival. He has also produced multiple music albums, taught middle school and high school music for 6 years, and completed a Master of Music degree in Choral Conducting at Rowan University. There is a wealth of information here, both about South Jersey Piano Service as well as pianos in general. Please visit the rest of the website, and follow our blog if you’d like to learn more about pianos in general as well as how to take care of yours better! If you have a question or would like to set up an appointment, please feel free to use the form below, or call or email directly. Thank you! Need a piano moving quote? Please note: some ad-blocking and popup-blocking filters can interfere with the form submission. If the "submit" button is not working, try temporarily disabling your ad-blocker. Alternatively, you can also contact us directly via email. It is often difficult to know ahead of time exactly how much an appointment will cost, but the following is a breakdown of the most common services and current pricing. Prices are subject to change. These prices are valid as of January 1st, 2019. Please confirm pricing when scheduling your appointment. Note that additional fees may apply for travel in some areas. Two-pass tuning, often necessary for pianos that have not been regularly maintained. Minimum charge for house call to diagnose, repair, evaluate, etc. Additional labor and parts charges may apply. Not applicable to tuning appointments. *These prices are provided only as estimates for frequently requested services. Final cost will depend on the number of repairs, piano make and model, and other factors. When scheduling your annual tuning appointment, you should bring up any work or repairs you are interested in having done. Upright 5-part system or Grand 6-part system. Virtually all piano manufacturers and technicians are in agreement that pianos should be tuned no less than once per year. This is a good benchmark. Many manufacturers recommend two or more tunings per year, but for home pianos that are not being moved or subjected to temperature and humidity swings, once a year is generally sufficient. More frequent tunings are often necessary for churches, schools, or private studios where pianos get heavier use and/or less climate control. What happens to a piano that doesn’t get tuned regularly? Humidity makes wood parts in the piano swell, with many negative consequences, the most immediate being that strings get pulled sharp as the pin block tightens. Dryness makes wood shrink and even become brittle, with obvious negative consequences, the most obvious being a loosening of the pin block and a resulting drop in the piano’s overall pitch. Dust accumulates, slowing down moving parts inside the piano and eventually accumulating enough to make keys and other action components stick. Moth, insect, and rodent infestations are far more common in pianos that are not maintained. This is often exacerbated in pianos that are also rarely played. What is involved in a piano tuning? The most basic and important part of a piano tuning is adjusting the pitch of individual strings in the piano. Many piano players do not realize that although a typical piano has 88 keys, they have well over 200 strings. The upper two-thirds of the piano has three strings per note, while the lower range consists of monochords (one string) and bichords (two strings) that are copper-wound, heavier strings. When tuning, the piano technician is striving to get the piano “in tune with itself” – this is the simplest way to explain the relationship of each note to every other note. Far from being a simple formula, this is determined by temperament and stretch and in reality varies slightly for every single piano based on many acoustic factors. It is also my philosophy that a piano tuning appointment should address any other problems, immediate or potential, that the piano may have. Much like a good mechanic performing routine maintenance on your vehicle, I consider an annual piano servicing appointment an opportunity to make sure every aspect of the piano is functioning optimally. I frequently fix or adjust small problems as I go, and for larger or systemic issues I will be sure to bring them to your attention and have a discussion about the possible courses of treatment. Do you use an electronic tuning device (ETD) or do you tune by ear? Both. While it is certainly possible to tune a piano well exclusively by ear (and this has been the practice for the last 200 years), there is also no reason to reject out of hand the benefits of modern technology. I use an ETD for certain parts of the piano tuning, but am constantly checking its results by ear. There are also parts of the tuning that I do entirely by ear – most significantly, the unisons (two or three strings that correspond to the same note). Does my piano need any other work besides tuning? This is a common question, and of course the answer varies. If you notice any sluggishness in the movement of the keys when you play, notes that do not sound all the time, keys that “stick,” pedals that do not work, etc., then there is probably regulation work that is needed. The extent of regulation work is up the customer, and my ultimate goal is for the customer to enjoy playing the piano and not have any mechanical problems getting in the way of that. Besides mechanical issues, there are many factors that can negatively effect a piano’s tone quality. “Voicing” addresses the hammers themselves, reshaping, needling, or hardening them to adjust the timbre of the struck note. In older or heavily used pianos, restringing may also be a necessary step in reviving the full potential of sound quality in a piano. This is particularly true in bass strings, where dust and grime collect over time and gradually yield a “thuddy” or “tubby” sound. Where is the best place in my home to put a piano? The most important advice I can give for pianos in homes is to keep them away from direct heat and direct sunlight. Modern homes, with good exterior wall insulation, are not as hostile to instruments as older homes. It is still generally advisable to put pianos on an inside wall to avoid temperature changes as much as possible. For homes with forced air heat, the piano should be kept away from any vents. Direct sunlight through windows can also very quickly fade or damage the finish of pianos, in addition to causing other problems as it warms and dries out the cabinet. What can I do about keys on my piano that are sticking or sluggish? Often this is a simple problem that can be fixed in the course of a routine piano tuning, but in some cases it may involve more extensive time or the replacement of parts. What can I do about a pedal on my piano that’s not working? Again, often a simple fix, but best taken care of by a professional technician at a routine appointment. During a piano tuning appointment, I do not charge extra for minor repairs or adjustments. To determine a piano’s age in the absence of official documentation, the make (brand) of the piano is needed, along with a serial numbers. Serial numbers are found in a number of different places. For grand pianos, the most common place is directly underneath the music desk, etched into the brass-painted plate next to the tuning pins, or in the pinblock itself. For uprights, it can sometimes be found on the back of the piano, or inside the top of the piano, in the pinblock area. The make and serial number of a piano can be used at websites such as Bluebook of Pianos to look up the age, although the number of brands represented is limited. For other piano makes (particularly older pianos), the information can be found in atlases. Most piano technicians carry piano atlases and can find this information easily. Piano value is determined largely by the current market in your geographical area. In general, old uprights and spinets have very little resale value, although they can still be perfectly viable instruments for home use and practice. Grand pianos usually have at least some resale value, with newer instruments, larger instruments, and well-known brand names increasing the value significantly. Why is piano tuning so expensive? In reality, piano servicing appointments are no more expensive than other in-home services such as plumbing, electrical, HVAC, etc. As with those services, however, there is a significant overhead expense of equipment, parts, liability, business fees and taxes, and travel involved. Remember whenever you have anyone working in your home, the fee you pay them is not their hourly wage! It has to cover all aspects of running the entire business. Do you give any discounts on piano tuning? Yes. Customers with multiple pianos being serviced in the same location and in the same appointment may be eligible for a discount. Also, referral discounts can be given in some situations. Feel free to ask about discounts when scheduling your appointment. It is always my goal to give you the best value I can. Cash, personal/business check, or credit card (Visa/MC/AMEX/Discover). Payment is due upon delivery of services. Exceptions can be made for churches, schools, and other institutions – Net 14 days – in most cases. Feel free to ask anything you’d like by clicking the Contact menu option and using the form on that page. Pianos are made primarily out of wood and metal parts. Both materials are significantly affected by temperature and humidity. Combined with the fact that pianos are extremely complex instruments with thousands of small parts under immense amounts of tension, the smallest changes in relative humidity can have a significant impact on the tuning and stability of the piano. Wood expands as it takes on moisture, and contracts as it loses moisture. This is the most basic and important reason that humidity control is so important for pianos. In southern New Jersey, I have found that indoor relative humidity is often extremely low during the winter months, with heat running regularly, and dry air circulating around the piano. Unfortunately, relative humidity often gets very high during the summer months, particularly in churches and schools, or homes with no air-conditioning. I have seen these conditions take a severe toll on a number of otherwise fine pianos. 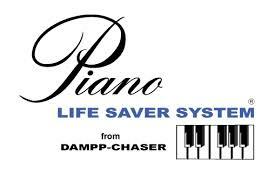 The Piano Life Saver system by Dampp-Chaser is a self-contained humidity control system that is installed inside (verticals) or underneath (grands) your piano, and can cycle between humidifying and dehumidifying modes. It keeps the crucial components of your piano, such as the pinblock and soundboard, at nearly constant moisture levels year-round. The cycling between humidifier and dehumidifier is controlled by a sophisticated humidistat, and the system uses very minimal electricity due to its small size and focused application. I can whole-heartedly recommend this system, and due to the positive results I have seen and the dire need of such a system in our climate, I have acquired an installer certification with Dampp-Chaser. I particularly recommend the Piano Life Safer system for churches and schools, as they typically have extreme temperature and humidity swings during the course of each week. It is also of great benefit in homes with forced air heat, or with no central air-conditioning systems. Interested in a Piano Life Saver system? Call, email or use the contact form to ask for a brochure or an estimate. For more information, visit pianolifesaver.com. The copper-wound bass strings on your piano collect dust and grime much more quickly than the plain-wire treble strings. If you don’t believe it, you can see it plainly in the picture; the portion of the string under the damper on a grand piano looks as good as new, while the exposed part of the string has turned almost brown over time. And this was not an old piano! This is the primary cause of tone loss in the bass over time. Gunked up bass strings, unsurprisingly, do not produce good tone. The best solution, of course, is new bass strings. Measurements can be taken to replace all copper-wound strings with a complete set of new strings customized to the proper size and length (different on every piano model). New bass strings are often needed well before treble strings. Another option is to clean the bass strings. There are several ways to do this, and a good cleaning can yield surprising improvements in tone quality, at a lower cost than string replacement. To be thorough, however, the strings have to be removed from the piano. So there you have it. If your piano has a tubby-sounding bass, poor sustain, or just in general a dead tone in the bass, there are things that can be done! Talk to your piano technician about the options. When a piano has not been regularly maintained, it often drifts very far from its target pitch center. Most pianos are manufactured to perform optimally at A440: with the note A4 being tuned to 440hz and everything else tuned to that. When a piano has been neglected for a number of years, it’s not uncommon for it to be as much as 100-200 cents flat – 100 cents being the distance between two notes on a piano. In other words, a piano that is 100 cents flat sounds a B when you play an C. This is a problem for many practical reasons, but the most basic is that the piano is designed to work and sound best at a certain level of tension on the strings, and anything significantly less is compromising the performance of the instrument. The other fact that many piano owners do not realize is that pianos do not go uniformly out of tune. As you can see in the picture, the notes on this neglected piano vary from 90 cents flat to 176 cents flat, just within a couple of octaves. That’s the difference of almost an entire note! Obviously, tuning the piano at a pitch lower than A440 (known as “floating” the pitch) is not a good option, since it would still require massive adjustment of some notes for the piano to be in tune with itself. And large variances like this are quite common in instruments that have not been regularly tuned. Keep on top of your piano tuning! You don’t want to be in the position this piano is in, because the piano will take multiple tunings to be stable again, and the longevity of the instrument will be negatively affected. Tuning is not the only maintenance that pianos need! As dust and other debris accumulates inside a piano, age and routine use wear down moving parts, and hammers compact and form deep grooves, various other maintenance tasks become essential. There is no standard interval for these maintenance tasks; but as a general rule, the more use the piano gets and the more advanced the pianists using it, the more frequently they should be done. Many pianists are simply not aware of what a well-regulated and well-voiced piano feels and sounds like, and don’t realize what they’re missing! As a general rule, any instrument that is being used by an advanced pianist, or for any performance purposes, should have voicing and regulation touched up on an annual basis. A thorough cleaning and regulation will generally be necessary every few years. If these tasks are done on a regular basis, the costs and time involved are much more manageable. In other cases where general maintenance has been neglected (even if the piano has been tuned regularly), it may require one or two full days of work to get the instrument back in shape. Such a job is more costly, but still more than worth it for the health of the piano and enjoyment of the pianist and audience.